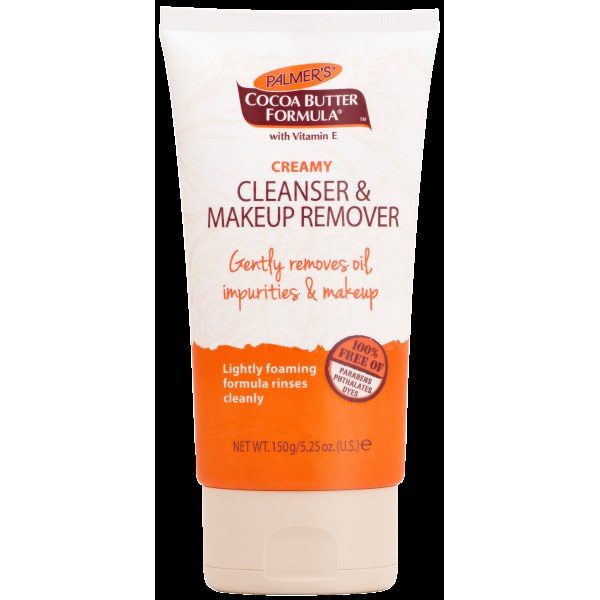 A beautifully creamy cleanser enriched with the natural goodness of Cocoa Butter, Palmer's Creamy Cleanser & Makeup Remover will lightly lather upon contact with water, without drying or dehydrating skin. A unique blend of Cocoa Butter, Vitamin E, Shea Butter, Aloe and Evening Primrose gently remove impurities, oil and makeup whilst helping skin maintain it's own moisture balance. Ophthalmologist and Dermatologist Tested. Safe for Sensitive Skin. No Parabens –No Phthalates – No Dyes. 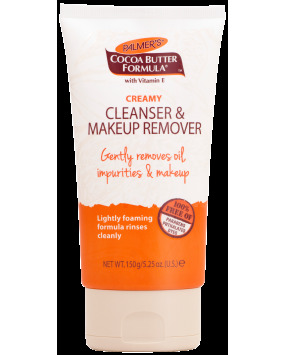 Apply Palmer's Creamy Cleanser & Makeup Remover to wet skin with a gentle circular motion creating a light lather, rinse completely. Follow with Palmer’s Cocoa Butter Formula Moisturizing Day Cream or Moisture Rich Night Cream for perfectly balanced skin. Cocoa Butter - Ethically & sustainably sourced by Palmer’s from cacao plantations in West Africa, Cocoa Butter is a rich natural source of vitamins, flavonoids, antioxidants and polyphenols. The unique Cocoa Mass Polyphenols fight free radicals and help skin perform at its beautiful best. It moisturises by bonding with the natural oils in your skin, nourishing deeply and without irritation. Cocoa Butter is also naturally rich in Vitamin E, a powerhouse vitamin for optimal skin health, leaving it radiant and beautiful. Vitamin E - An antioxidant superhero, Vitamin E is skin’s number one friend, smoothing scars and protecting skin from damaging free radicals. Enhances the protective function of skin and decreases the appearance of lines, wrinkles and scars by keeping cells hydrated. Aloe Vera - One of nature’s natural hydrators, aloe vera is known not only for its superior moisturizing properties but also for its ability to soothe irritated skin, calm redness and reduce inflammation. Evening Primrose Oil – Natural plant extract that has anti-inflammatory and emollient properties to help keep skin calm, clear and soft. Helps skin repair the signs of ageing. Helps keep skin supple and soft. Enriched with vitamins to promote healthy skin. Palmer's raw, natural shea butter is ethically and sustainably sourced in Burkina Faso. The supplier in this region has adopted a sustainable partnership with the womens cooperatives that help in the development of these rural areas through the creation of jobs and transparent remuneration. Palmer's is proud to be a member of the Global Shea Alliance, an organization that works to empower and improve the lives of women who work to harvest Shea Butter in West Africa.